The presumptive 2016 presidential candidate was asked about her recent accusations on NPR that Matt Drudge and Karl Rove of Rove.com were using their influence to plant “false information” about her. “You know, I don’t know, there’s so much, so much opinion and information out in the world and the best way to deal with bad information is with good information, and the more the merrier, right?” she said. It would appear that in her mind, sites like the Drudge Report, World Net Daily and Infowars consist of “bad information,” even though the stories reported on are routinely sourced from government documents and statements from officials. Clinton was at the BookPeople bookstore in Austin to sign copies of her latest book “Hard Choices” and the attendees of the event faced TSA-style security. Visitors were not allowed to enter the bookstore with bags and before entering the top floor of the building, where Clinton was signing books, they were told to empty their pockets for a wand search. Several secret service agents and Austin police officers were managing security, and one uniformed Austin SWAT officer was also present. In addition to the security inside the building, at least one city street was closed off for three blocks. Austin was stop number 10 for Clinton’s book tour, which so far has been fraught with disappointments. Sales of her memoir in the first week were “well below expectations,” according to a veteran publishing source. “They will be lucky to sell 150,000 total lifetime,” he said, and to put that into context, other reports state that one million copies of the book have already been printed. Some analysts said that Clinton released the memoir in order to paint her own narrative and defend her record ahead of another presidential campaign. Unfortunately for her, the book was torn apart by critics. “In this book, like in ‘The Lego Movie’ theme song, everyone is awesome!” Politico’s Mike Allen wrote. “She goes on at great length, but not great depth,” he added. 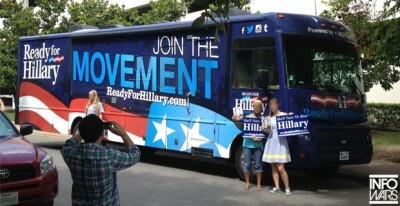 To top it all off, the “Ready For Hillary” book tour bus also broke down in Philadelphia.